April is Distracted Driving Awareness Month. A national study published last month shows that distracted driving is at its highest in the State of New Jersey. New York State ranks number four of the most distracted driving Sates. Florida and Missouri are second and third. The report entitled “Heads Up, Phone Down: Distracted Driving Intervention” also found that Wyoming drivers are the least distracted. Distracted driving is a bigger problem on the East Coast than on the West Coast. 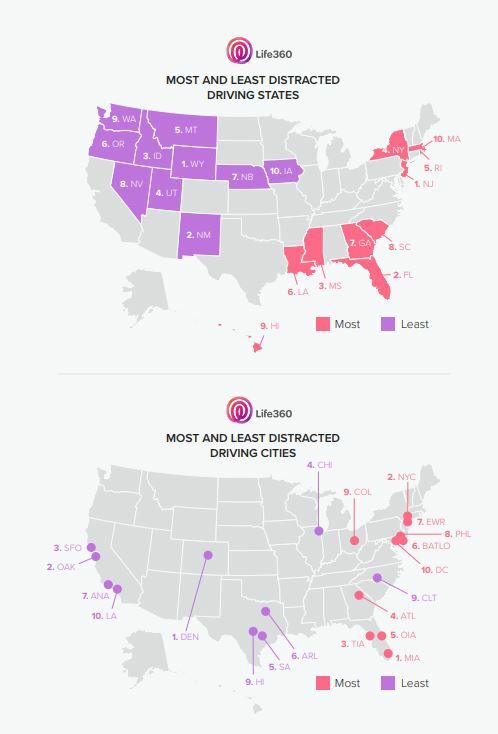 The states with the worst distracted driving problem are mostly located in the East and the South East while the less distracted drivers are mostly located in the North West. While looking at cities, Miami has the worst problems with distracted diving while Denver has the most disciplined drivers. The report found that drivers look at their phone every four miles in Miami but only every 6.25 miles in Denver. New York City comes right behind Miami. Globally, distracted driving kills 3,000 people every year in the US, that’s 9 people every day. Distracted drivers are often more reckless than non distracted drivers. The study indicates that distracted drivers are four times more likely to speed and 40% more likely to brake hard than those who are not distracted. In term of demography, teens are 6% more likely than their parents to use their phone while driving. Parents are almost as bad as their kids. While drivers look the most at their phones during rush hours, most distracted driving accidents usually occur in the afternoon. Phone addiction is a real problem for drivers and American States have different regulations in place to fight this problem. However it doesn’t seem to be enough. To prevent yourself from being distracted while driving, let your friends and your family know that you will be unable to answers their calls because you are driving and put your phone on do not disturb while you are driving. If you have to use your phone, pull over. If you cant resist the urge to use it, put your phone somewhere where you can’t access it while you are driving.